Baldwin's RF-16 Sharknose diesels distinctive contours were inspired by Pennsy's T1 class steam locomotive and certainly appear related to the GG1. Known as excellent luggers, the Sharks saw service hauling heavy ore and coal drags. The RF-16 Shark beat the F7 with 100 additional horsepower and tied the FA2 with 1600 horsepower. 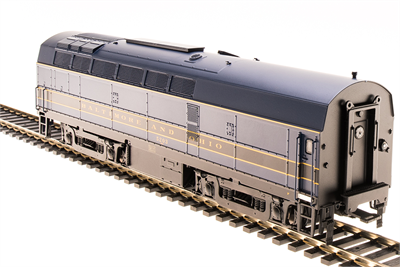 Contrary to many reports, Baldwin diesels could be run in MU operation with diesels built by other makers if the units were ordered with the proper MU equipment from the Baldwin catalog. There are two surviving Sharks owned by the Escanaba and Lake Superior Railroad. DID YOU KNOW? Not even the most expensive of brass models have accurately modeled the Sharknoses unique front end profile. BLIs Sharknose is properly modeled with the correct front end profile - an industry first.